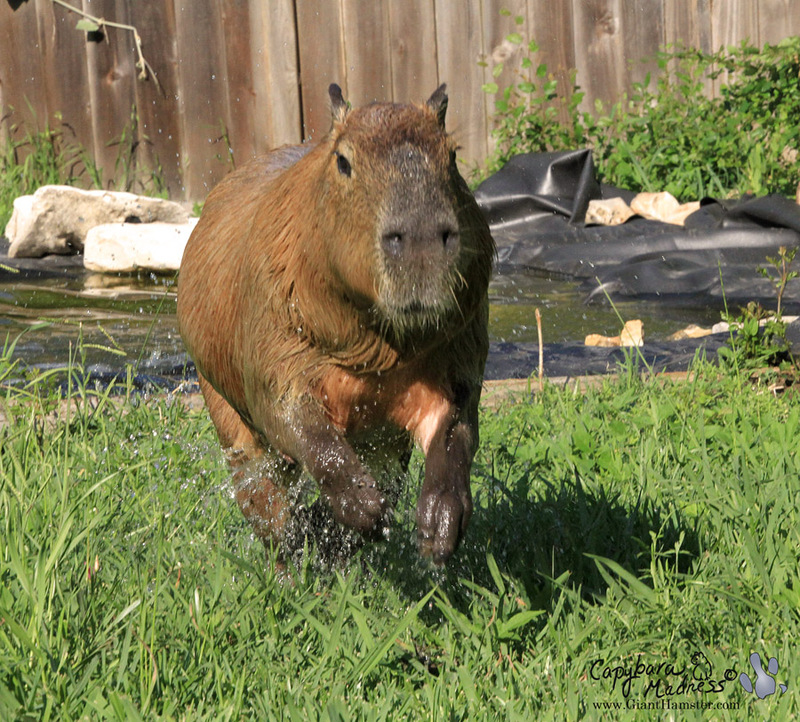 This photo doesn’t have much to do with this blog post, I just want to make sure everyone sees how handsome and athletic I am. Plus, most of the photos in this blog won’t have me in them so we need to start with something to catch your attention. This blog is going to be about things I see around me on our property. 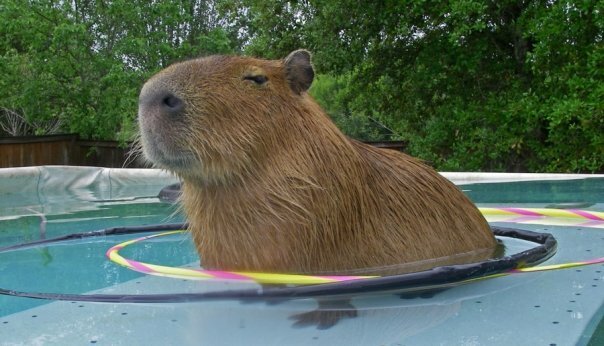 Some of these things are just normal, boring things but some are pretty or surprising or pretty surprising! 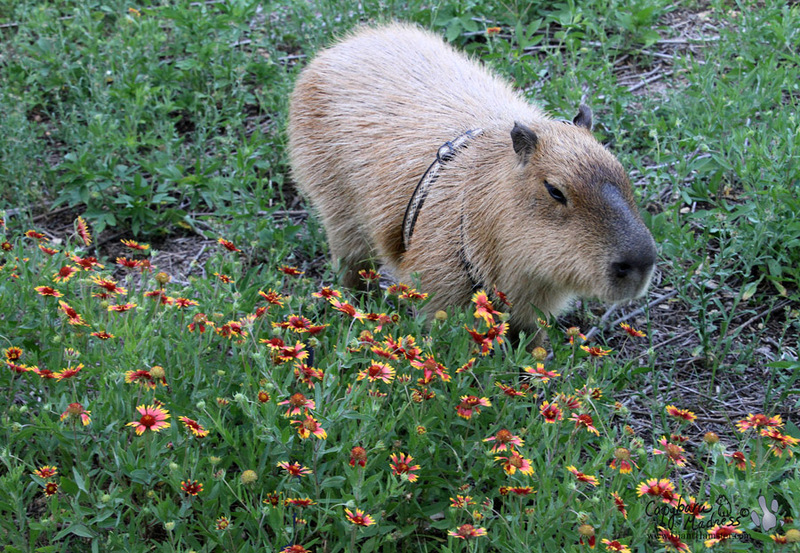 Melly is always trying to take my photo with some flowers, but not these. She seems to think I will hurt myself on them. They are out in the horses’ pasture and they don’t get hurt. I think Melly should give me more credit. It’s funny the way the flowers look pink before they start to open. Then they are orange while they are opening up. And finally they are yellow when they are all the way open. It’s magic! Melly did manage to get this photo of me with some purple verbena. 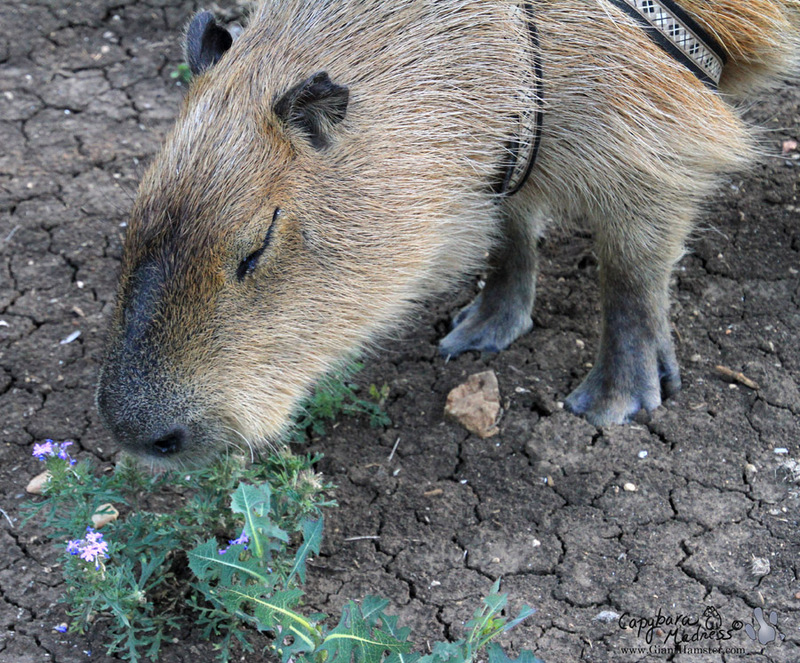 Doesn’t it look like I was smelling the flowers? Well, I was! With a lot of plants you can tell by the smell whether they taste good or not. Turns out verbena do not. You don’t know all the dragging, “Go this way, Gari!” and “Not that way, Gari!” that I put up with so Melly can get photos of me with flowers. It is so silly. And these Mexican blankets also did not smell good to eat. Lame! 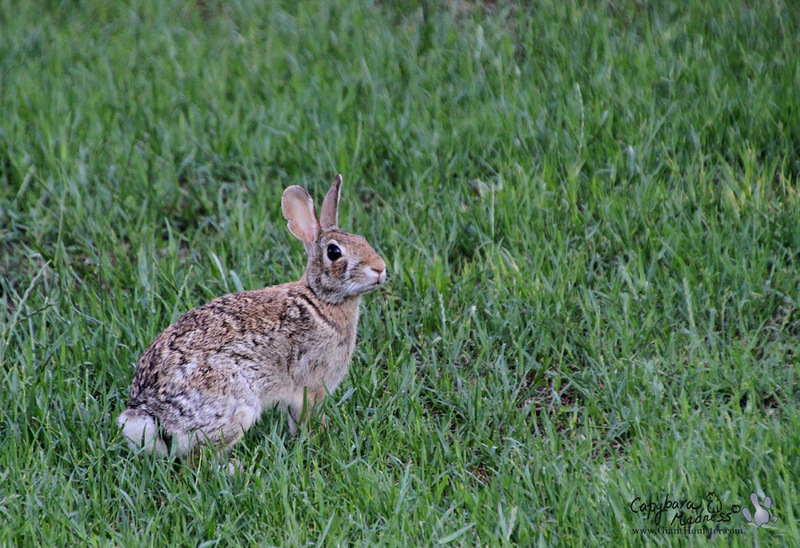 We have a lot of little wild rabbits around the property. They are cute but not very good for chasing. Unlike Oakley Bunny, the wild rabbits really run away when I chase them and they are much too fast for me. So wild rabbits are only for looking at, not for chasing. Do you see the bunny in this photo? He’s behind the fence, I don’t know why. 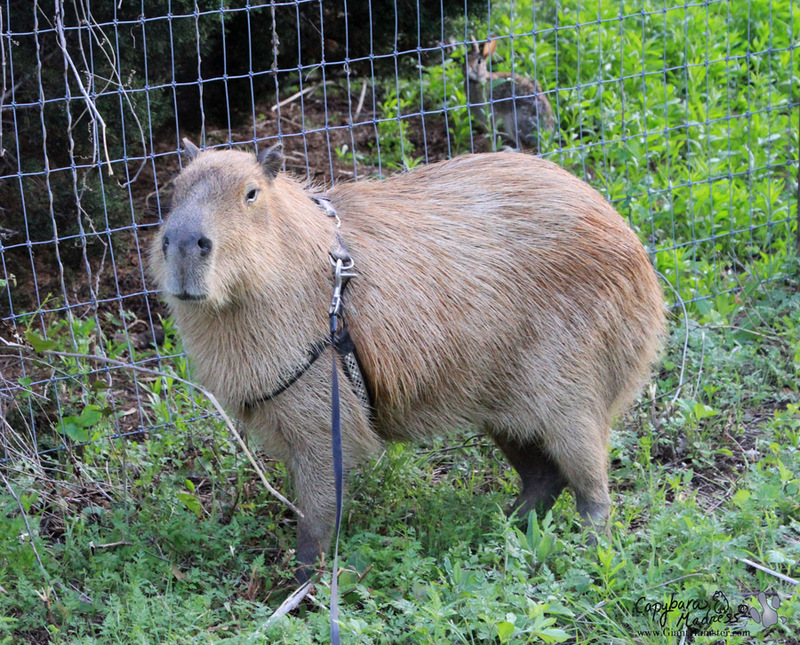 I’ll tell you something surprising about him though, he can fit through the little rectangles in the fence wire! Those rectangles are only 2″ x 4″! 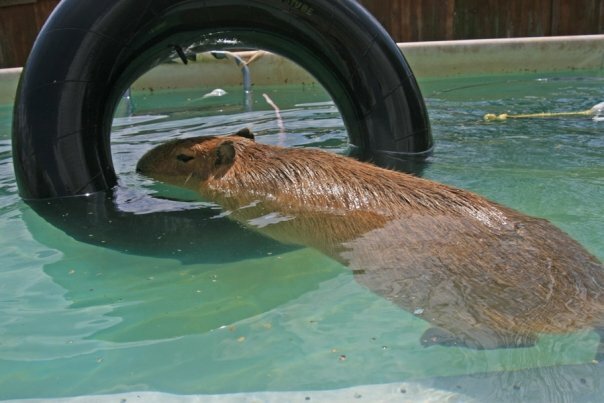 I can hardly fit through a hole 2′ x 4′! Just think how small those rabbits are! This is the thing I saw that made me think about doing a blog post about things I saw. (Whew! That was a complicated sentence!) 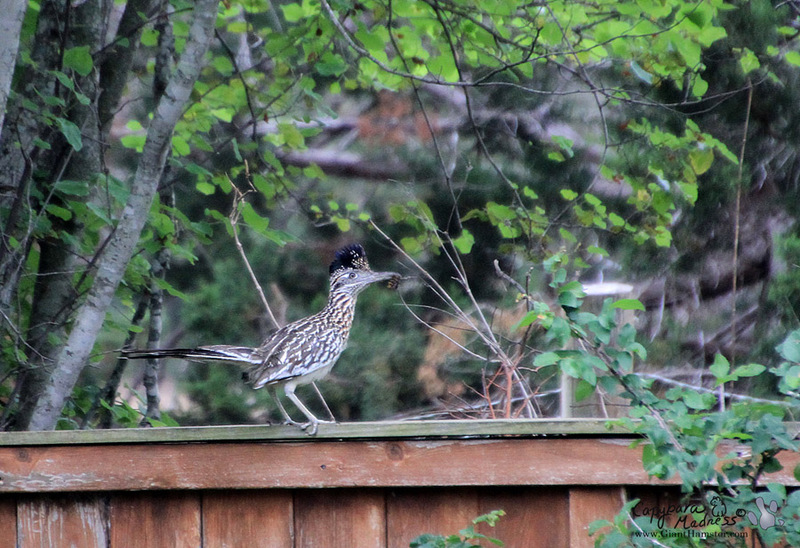 This is a roadrunner running down the top of our fence. Meep! Meep! I think he is holding a caterpillar. That makes me sad because I like caterpillars. But it makes me happy because I like roadrunners. Life is so complicated! The roadrunner ran into our house! 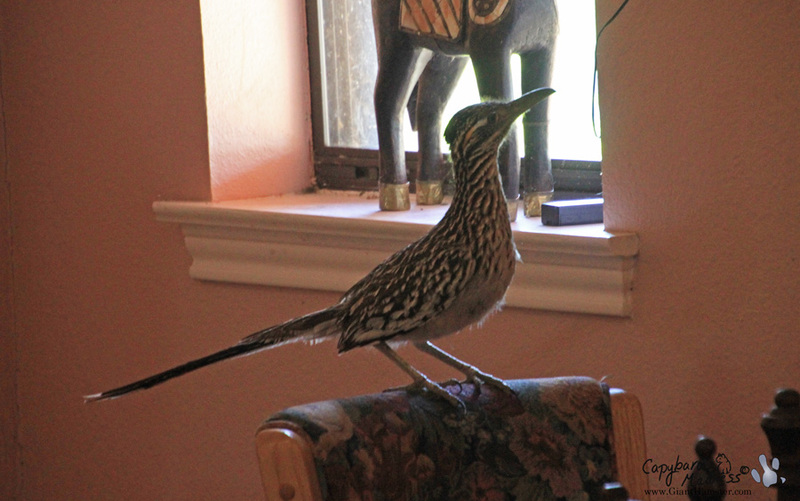 One day I left the door open, as always, and the roadrunner ran right into our house! I guess he thought we have a lot of bugs in here, which we do. Mostly ants. I don’t think roadrunners eat ants. He ran out again after a little while. Well, that’s going to have to do it for now. I see a lot more things around here though so I think I’m going to have to continue this blog later. 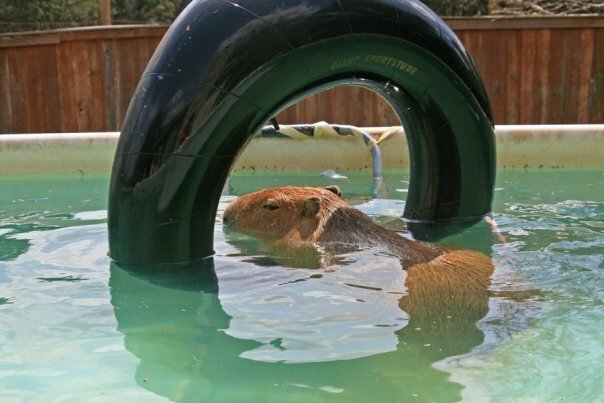 Things sure are good when seen from a Capybara’s point of view. 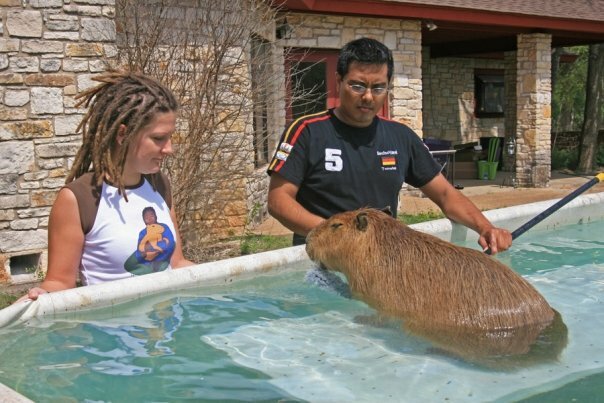 I love to have a Capybara companion too, maybe a couple of ’em when I finally have a house with lots of free space for running and a yard full of edible plants. 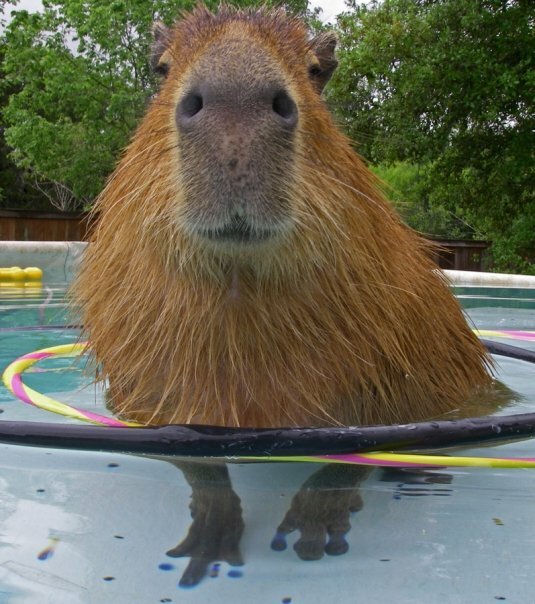 I’d lov to hug them hog sized rodents. 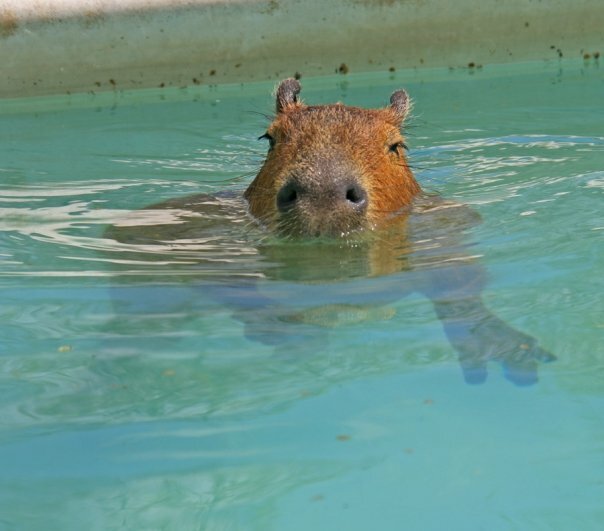 Such lovely mammals. 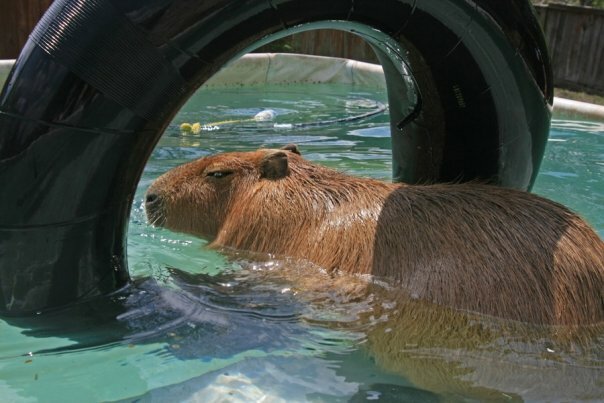 Keep blogging Gari the Capybara! You must have very exciting walks! I have never met a bunny. Mom says your cactus are pretty and I agree. Thanks for another lovely blog Gari. I love the first picture of you too. Very handsome. what a great yard you have Gari. 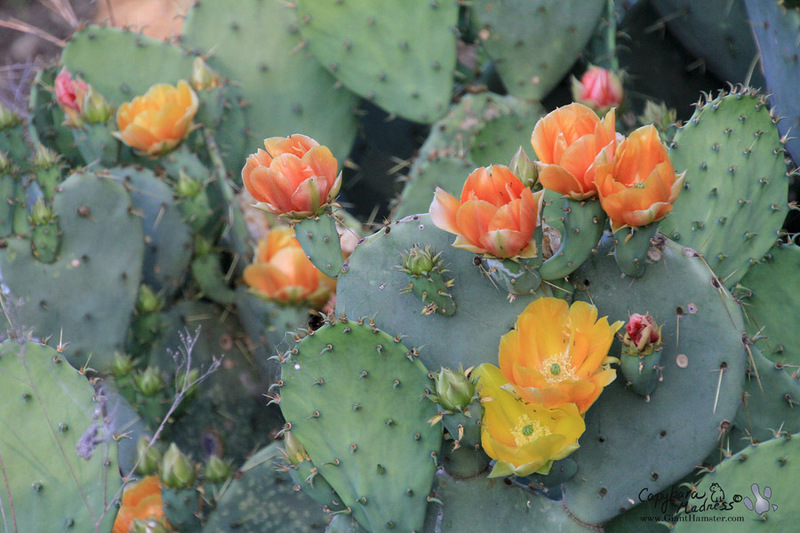 i love the prickly pear. we dont have those here in New England. we dont have roadrunners either! meep meep! It felt like you were giving us a tour of your yard, Gari. 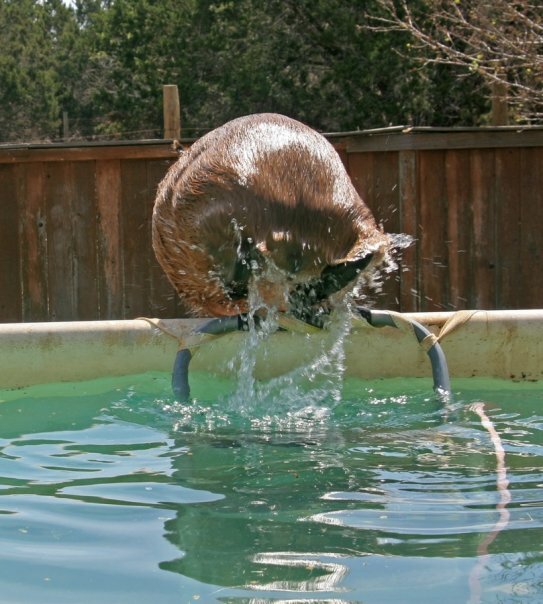 And I was impressed with your athleticism in that first pic. I can see why Melly like pics of you with flowers, it’s cute. And you have some really different flowers that I do up here in Ohio! That must’ve been something when the roadrunner got into the house. Hope it didn’t take long for him/her to get back out again. Just imagine all the stories they told their friends. I live in Northwest Austin. I often see deer, raccoon, cardinals, and squirrel in my neighborhood. I love the pretty flowers in your yard. You look like you have lots of fun in Buda. You have a wonderful blog. Thank you for sharing with us.